Ireland is one of Scotland's closest neighbours, and their shared heritage runs deep; it is reflected in surnames (Mac or Mc? ), language (Gaelic) and not to forget their national drink (Whisky or Whiskey?). That shared ancestry is also reflected in commercial ancestral DNA results of the modern Scottish and Irish population (and in the DNA of their respective Diasporas). Research at Scottish Origenes has revealed 2 very different but quite distinctive male genetic markers shared in equal measure by the Scots and Irish ; R-M222 and I-M223. If you carry one of these markers then you are a true Scots-Irish (or is that Irish-Scot?). You may recently have noticed the Scots-Irish link revealed in FamilyTree DNA's SNP tree (see attached snapshot above). Up to 30% of Protestants in Northern Ireland (descendants of Lowlander Scots who settled in Ulster in Ireland from 1610AD onwards) carry the R-M222 genetic marker. In addition about 12% of Catholic males on the island of Ireland and about 5% of all Scottish males also carry the R-M222 genetic marker. In fact, two of the most notable males for whom I’ve done work; the President of Ireland Michael D. Higgins and the late Mr Norman P. McClelland (founder of Shamrock foods and notable American of Ulster-Scots heritage) both carry the R-M222 marker (they are both R-M222+ve). President Higgins paternal Catholic Gaelic Irish ancestors originate in Southwest Ireland, while Mr McClelland's ancestors were Protestant Lowlander Scots who settled in Ulster in Northern Ireland! Their shared paternal ancestor lived approximately 1,000 years ago; but their subsequent paternal ancestral journeys took very different paths. 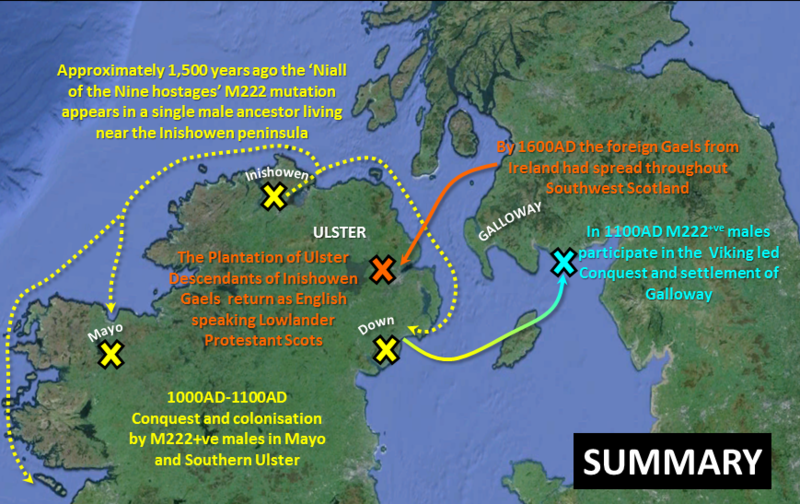 The R-M222 Y-DNA genetic marker first appeared in a single male who lived on, or near, the Inishowen peninsula in the far northwest of Ireland approximately 1,500 years ago (+/-300 years). If you are R-M222+ve then your paternal ancestry will involve lots of Dohertys! The Dohertys are ubiquitous among the vast majority of R-M222+ve test subject’s (look to your 25 and 12 marker matches). That’s no coincidence, Doherty is the most common surname in Inishowen and they were the most prominent Clan in Inishowen; their castles and towerhouses dominate that area! However, scientific research and Y-DNA Case Studies performed at Irish Origenes have revealed areas beyond Inishowen shores where R-M222+ve males predominate in the local population, particularly along Irelands west coast, Southeast Ulster and Southwest Scotland (Galloway). Clues as to why these R-M222+ve Gaels began colonising throughout Ireland and Scotland can be found in their origin; Donegal (Dún na nGall meaning ‘base or fort of the Foreigner’) and their descriptive surnames which they took with them like Gallagher (Ó Gallchobhair meaning ‘Foreign helper’) who upon settling along the west coast of Ireland acquired new surnames like Higgins (O'hUigin meaning ‘Viking’) and Halloran (O'hAllmhurain meaning ‘Pirate or Stranger from overseas’). 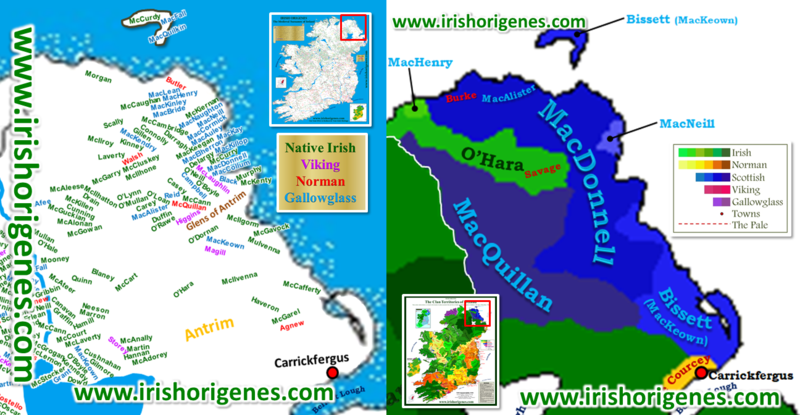 Modern DNA science indicates that just after the appearance of surnames (in 1000AD) the R-M222+ve Gaels of Inishowen had formed an alliance with Scandinavian ‘Vikings’ and that Christian-Gael and Heathen-Viking had together raided and colonised throughout Ireland. In support of this Viking-Inishowen connection, research at Irish Origenes has uncovered at least two individuals with recent Inishowen ancestry but with Scandinavian Y-DNA signatures, clear evidence of Scandinavian contact with Inishowen. Some of the R-M222+ve males who settled in Southeast Ulster took part in the subsequent Norse-Gael Conquest and colonisation of Southwest Scotland which was led by the King of Norway ‘Magnus Barelegs’ in about 1100AD. The land they conquered became ‘Galloway’ meaning ‘land of the foreign Gael’ a term used by the surrounding ‘Scots’ to describe the Gaels from Ireland who settled there. The Inishowen Gaels took with them to Galloway their genetic markers (like R-M222), their Gaelic language, and their surnames like McLaughlin, McGowan, McKean, Kelly and McGee (Gaelic surnames dominate Galloway; see green arrows in the accompanying surnames of Galloway image). However, in the areas where R-M222+ve Gaels settled permanently they acquired new surnames like MacClellan, MacCartney and MacKnight. 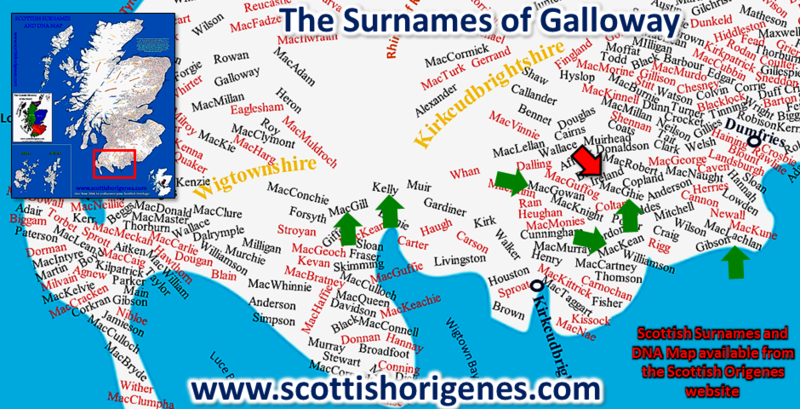 The Scots are a diverse bunch and many Scottish surnames reveal the origin of the bearer (click here), Galloway reveals the surname 'Ireland'' (red arrow; surnames of Galloway image). 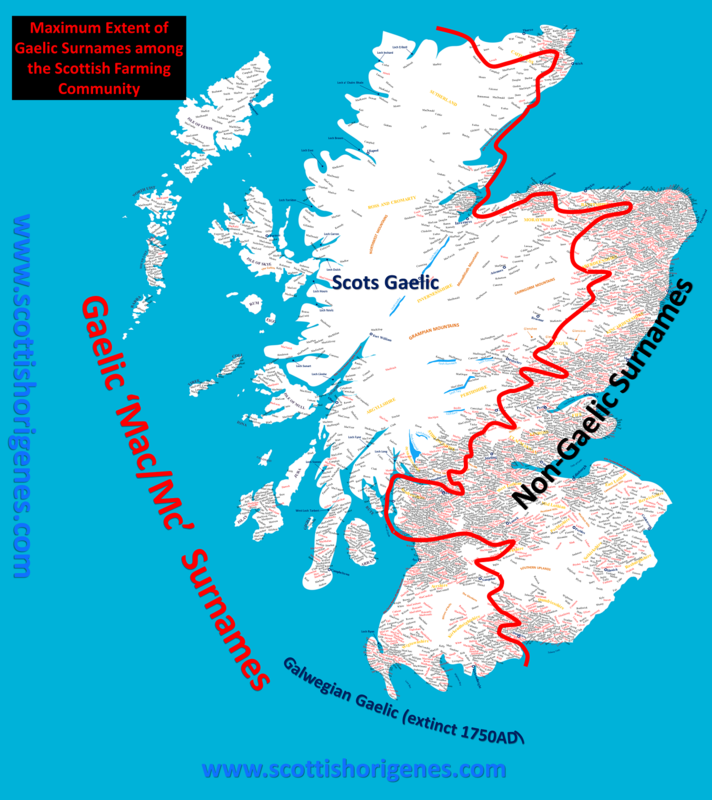 What’s particularly interesting is that Conquering Gaels and Vikings appear to have split Southwest Scotland between them, with the Gaelic-Irish (denoted by their 'Mac' surnames) colonising the area west of Dumfries town, while the Vikings (with surnames typically ending in '-son') colonising the area to the east. 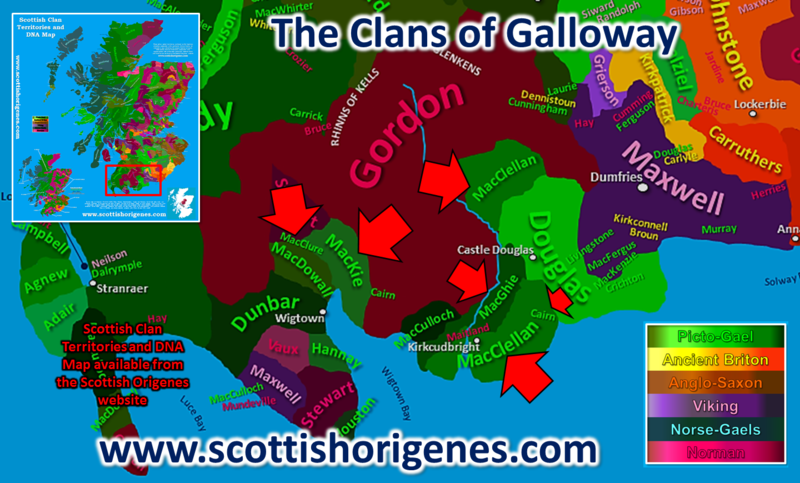 If one examines the Medieval Clan territories of Galloway the division between R-M222+ve Irish Clans (red arrows, Clans of Galloway image) and Viking Families is quite striking. Magnus was the last truly 'Viking' King of Norway and he was murdered by his Irish Allies in County Down in Southeast Ulster, it would appear that King Magnus had outgrown his usefulness among the Gaelic Irish and Viking settlers who divided his conquered territory (including Galloway) between themselves. While in Galloway in Southwest Scotland, the descendants of the Irish Gaels gradually adopted the English language (Gaelic was extinct as a language in Galloway by 1760AD, see attached image). They adopted the Protestant faith, and approximately 500 years after their ancestors had first arrived in Galloway, many would return as English speaking Protestant Lowland Scots during the Plantation of Ulster that began in the early 17th Century. Within Ireland they would have settled among their distant Gaelic Irish relatives, some may have been aware of their earlier Irish connection (Norman McClelland's family has always had a strong sense of its Irish identity). One of the puzzles of modern DNA studies has been a lack of DNA evidence for the Irish colonization of the Western Isles of Scotland, which historically gave rise to the Kingdom of Dalriada. It may simply be that there has been so much human movement back and forth between the Western Isles of Scotland and Northeast Ireland that the two populations are (at present) indistinguishable from one another! 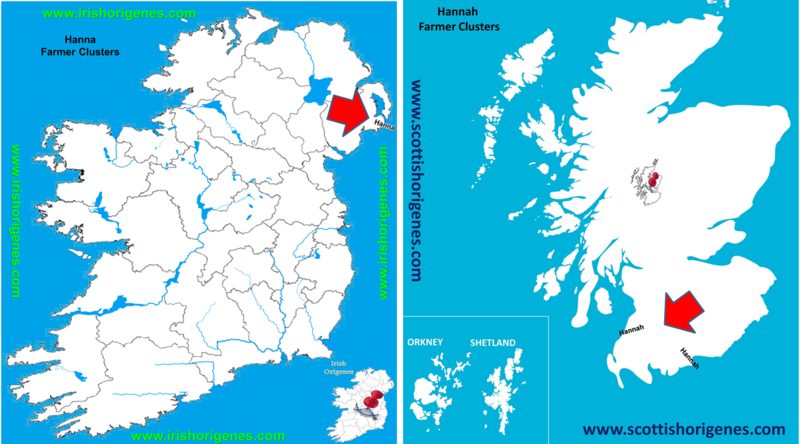 Given its proximity to Scotland, the descendants of Medieval Antrim in Northeast Ireland (which lies closest to Scotland) are 'genetically' more Scots than Irish (12 miles separate Antrim from Scotland). The descendants of even the Gaelic Irish in Northern Ireland (who are today overwhelmingly Catholic) tend to have earlier detectable links in their commercial DNA test results with Scotland (that includes the most notable O'Neill Clan). In fact, the Medieval surnames and prominent Clans of North Antrim are dominated by notable Scottish surnames that originated from the Western Isles, see attached image. BUT! 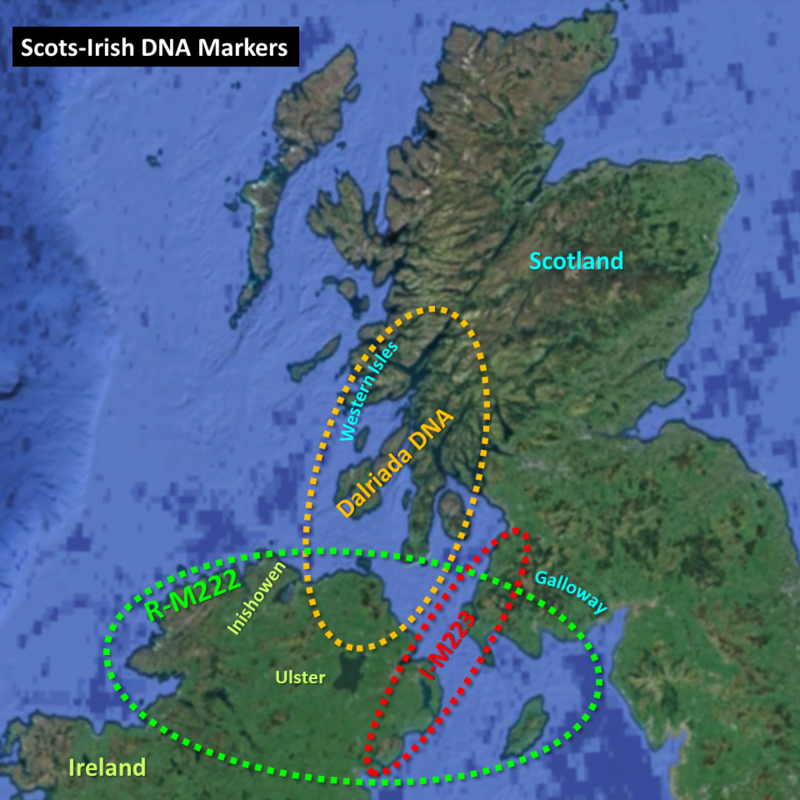 over time, and as more and more people participate in commercial ancestral Y-DNA testing, it may become possible to dissect out each wave of migration between Scotland and Ireland and identify some new Dalriadan DNA markers.